Originally opened in 1929, the Arcadian Court has a deep, rich history as a Toronto institution. As with many heritage sites, over time many layers of construction have been added, affecting the original design vision. 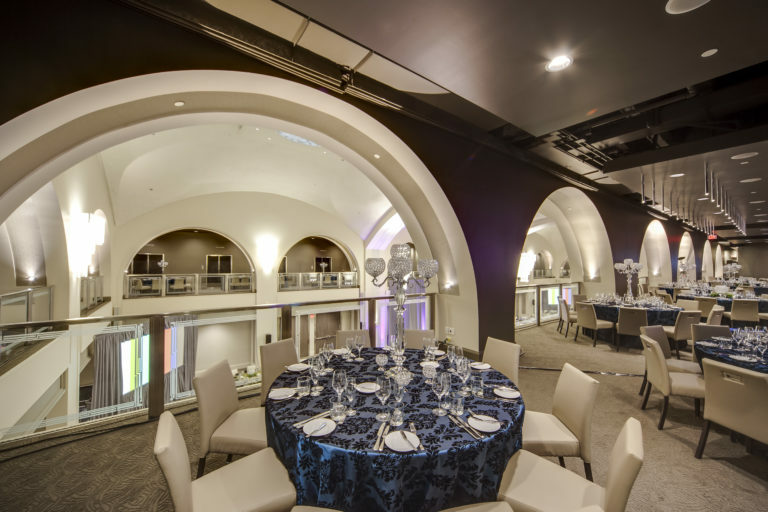 The project team created a space that brought back the splendor of the strong original Art Deco architectural features, and allowed for a mezzanine that offers an expanded 360° view of the interior volume. The 8,000 sf central court features four large chandeliers that are a deconstructed versions of the original Lalique crystal lighting. Hand painted frieze artwork highlights the two central archways, while the perimeter details are emphasized with accent lighting. Acoustic needs were addressed inconspicuously with panels on the mezzanine face, along with a framed feature surrounding the two central skylights. Working with archival photos, dating to 1929, metal patterned lattice was designed to cover the skylights to mimic the original architect’s concept. 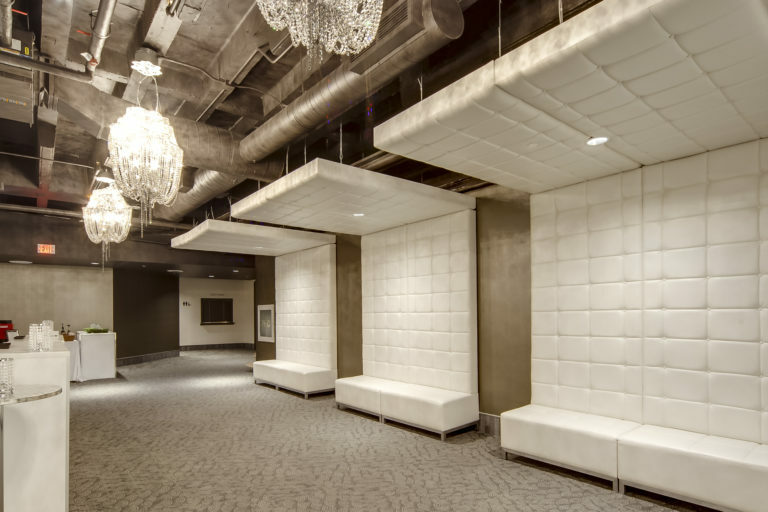 A break out meeting area, the Arcadian Loft, was also created as a unique event space in this building. Featuring 6,700 sf, this area draws from urban inspirations and is adjacent to the Arcadian Court. 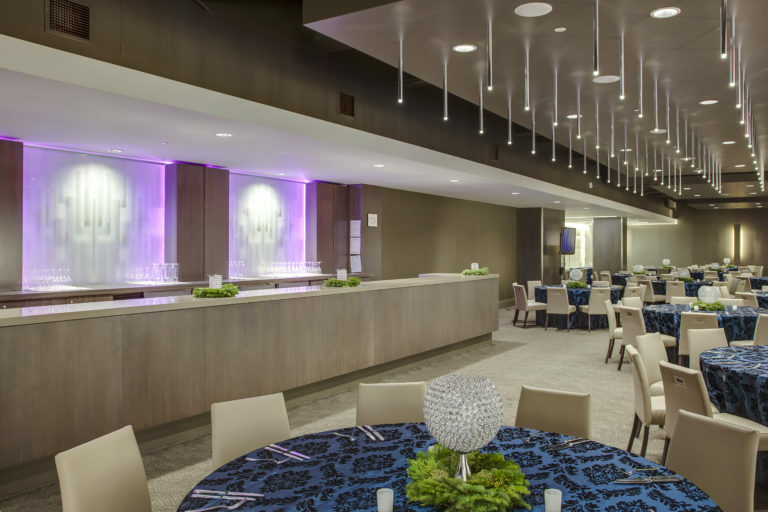 Exposed ceilings and stainless steel trimmed details, contrast with modern crystal chandeliers and metallic wall coverings. Divider panels add texture and thematic value. A reclaimed grey washed brick wall and oversized metal warehouse doors add to the loft aesthetic of the space. 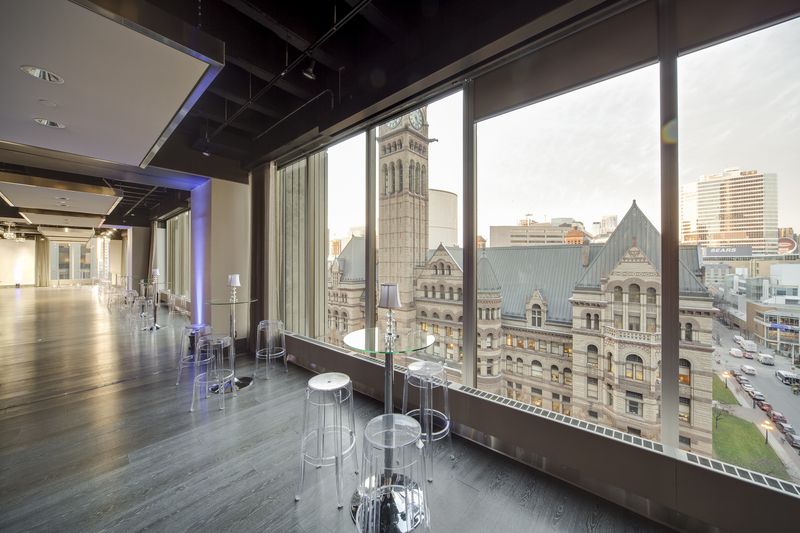 Translucent metallic grey sheers frame the stunning view of City Hall and Old City Hall, giving visual context for those in the event space.